Apple built and began selling its high-end OLED iPhone XS and XS Max models a month ahead of iPhone XR availability in an effort to sell users more expensive models before facing competition from its own new lower-priced, entry-level LCD phone-- at least according to the columnist and the think tank that were totally wrong about iPhone X sales last year. On one hand, it's fairly obvious that Apple is producing and selling its XS models first-- that's what it announced it would do. But for some reason, Wall Street Journal columnist Tripp Mickle thought it was necessary to source this idea as coming from "people familiar with Apple's production plans," which could correctly be interpreted as "anyone who watched the keynote presentation." It's the opposite of a secret that Apple's less expensive iPhone XR won't become available for another five weeks. The report observed that "the staggered release gives Apple a month to sell the higher-end models without cheaper competition from itself. It also simplifies logistics and retail demands and could strengthen Apple's ability to forecast sales and production of all three models through the Christmas holidays," both ideas it again attributed to "analysts and supply chain experts," rather than Captain Obvious. Last year, Apple was ready to sell its more conventional iPhone 8 models first, while the all-new iPhone X didn't become available until November. A year ago, this was reported as having a "dampening effect" on iPhone 8 sales as consumers waited for the fancier new model, an idea again repeated by the Journal in its most recent effort to make the mundane sound edgy and incisively critical. But hold on-- if consumers knew last year that iPhone X was coming and held off on iPhone 8, can't they also manage to wait for the XR (a significantly shorter wait given that it ships in October rather than November as the original X did)? Not in the case of the super-premium iPhone XS, according to Mickle and his partners. After thinking heavily and consulting some "supply chain experts," the paper reported being pretty sure that consumers would be totally fooled by Apple's product availability, and spring into action to buy phones priced at $999 to almost $1500 simply because the $750 XR won't be available for another month. Of course, the less-cynical explanation is simply that iPhone X shipped later last year because it was an entirely new product, and iPhone XR this year for the same reason. In fact, that's what Apple told the Journal. Additionally, Apple is already selling even more discounted iPhone 8 and 7 models starting at $450, so anyone looking for bargains rather than an ultra-premium new device isn't exactly being bamboozled by Apple's straightforward presentation of its offerings. While iPhone 8 was a significantly new model new last year, it was based upon the previous 7 design that Apple had a year of experience in assembling. This year's XS models are improvements upon the iPhone X model Apple has now been building for a year and is similarly experienced with. The new XR involves an entirely new display based on an advanced LCD panel with an all-new precision backlight designed to illuminate the rounded corners of a rigid display technology (rather than wrapping back upon itself as flexible OLEDs can). Here, Mickle uses two BOMs from a source I've never seen BOMs from before: analyst Mehdi Hosseini, with trading firm Susquehanna International Group. Usually, BOMs are generated by a think tank that specializes in putting together these really brainy accounting efforts. Here, an analyst scribbled up BOMS for two unprecedented new products that nobody has even taken apart yet. This is some next level magic-nuttery. Hosseini's numbers, supposedly accurate to the $1, claim that the XR costs $331 to build, while the XS and XS Max supposedly cost $355 and $371. This is absolutely ridiculous on so many levels it's hard to know where to start. First off, if the two engineering efforts only differ in component costs by $23 dollars, Apple wouldn't be selling them at the prices it set, with the XS a solid $250 higher. This is straight up asinine. Apple would either be foolishly leaving money on the table with the XR, or radically holding back demand for its best XS models by pricing them as such an unwarranted premium. The reality is-- as has long been known-- that Apple consistently aims to reach a target profit margin, sometimes suppressing its profits to launch new tech, and sometimes riding higher at the tail end of a production as components become cheaper. But Apple simply doesn't have massive shifts of profit margins on this level between its new product offerings. And if it did, it wouldn't be giving its supposedly massively more profitable XS models (with profit margins of $644 and $730 per device!) a brief window of pre-orders before dropping profitability by a huge degree with the XR (which would only deliver $420 per device). If these numbers were real, Apple wouldn't have introduced the XR at all this month, and would have secretly held it until XS orders were entirely satiated, then launched it as a cheaper alternative to boost up sales. That's what other companies do all the time. Telling us that Apple allocated just five weeks of exclusive XS sales-- when customers know the XR is coming at $750-- is just insulting. It's about as insulting as telling us that an analyst knows enough about the components and build costs of brand new iPhones to generate a reliable BOM. The problem with these BOMs is that they can't possibly be right over any length of time. On a simpler device, such as a commodity PC, you can total up the cost of off-the-shelf components pretty easily. On a proprietary, highly integrated device with custom designed silicon and few commodity parts that aren't customized by Apple in partnership with their makers, there's no way to really know how much parts cost. In Apple's conference calls, even its executives commonly note surprise in the dramatic effects of shifting component costs among commodity parts. The costs of developing custom silicon and producing chips in volume is complicated by the emergence of unanticipated issues: everything from political squabbles to storms and earthquakes hitting Apple's production partners. A big part of Apple's efforts involve hedging against component cost shifts. There is no simple price tag on components that can be added up to a neat, precise number that can serve as a foundation for unbridled speculation by journalists (particularly Mickle, who has a background in sports writing, not technology). Compare, for example, even the reasonably well-known cost of a rather commodity component such as storage memory chips. You could have generated an estimated BOM for Apple's iPhone 8 and Google's Pixel 2 last year, but in reality the fact that Apple subsequently shipped well over 200M phones with similar memory chips while Google's partners HTC and LG each shipped a negligible number of smartphones means they couldn't ride the same economies of scale as Apple in even among basic commodity components. Now consider the custom silicon work that both Apple and Google did in creating camera logic chips. Apple built this work into its A11 Bionic and shipped it across 120 million high-end iPhones. Google likely faced higher costs in ramping up its silicon efforts (whereas Apple was continuing custom SoC work it's been doing since 2009), but then wasn't able to amortize these expenses across the scant few million devices it produced, then sold at fire sale pricing with steep discounts. Clearly there's no way to compare BOM costs that simplify all this behind a guestimate for "camera logic chip." The iPhone X BOM estimate Mickle previously cited a few months ago suggested that all of the development expenses related to Face ID were somehow covered by a "camera module" that costs $16.70, as if TrueDepth was available off the shelf and Apple just pushed a shopping cart through a Walmart and put 50 million into its basket (and then refused to buy another 40 million, because it ended up being so expensive that "some" ended up not buying it). This sort of reporting is not journalism. It's farcical nonsense. Last year, demand for iPhone X (and AirPods) exceeded Apple's expectations. Across the last three cycles of 6-8 Plus models, Apple continued to describe its production mix as a learning process, with the demand for larger phones increasingly shifting upward. Even Apple didn't know this when it placed its first orders, before it began producing them and long before they went on sale. And a few years ago, Apple (and everyone else) appeared to think that iPhone 5c would outsell the better but more expensive 5s. Note that whenever Apple changes its orders in response to demand (which happens constantly), this is reported breathlessly as worrisome and potentially beleaguering. Yet here the same people who report supply chain order changes as alarming are using reports of Apple's purported initial orders as an airtight model for determining demand (and component costs) before they even go on sale. You can't have it both ways. Had this actually occured, it would have involved a lot of companies simply going out of business. In reality, Apple's suppliers-- even those with significant dependance upon Apple's production of iPhone X-- didn't note experiencing this at all. Even the difference in Mickle's "50 or 60 percent" ballparks would have resulted in $4 billion worth of lost production. That wasn't true at all. Apple's executives have explicitly debunked the idea that the Wall Street Journal picked up and reported as if it were true and supported by some sort of reporting work rather than just a fiction recited as an anecdote posing a historical event. Yet the fact that the Journal published such cocksure yet farcical reports of iPhone X facing doom—because customers couldn't afford it, or weren't interested in its new technology, or because Apple was fumbling to deliver it—is a black eye that is still visible as the same people roll out a story this year that is just as fantastical and untethered to reality, seeking to legitimize absurd BOMs and dubious supply chain checks. 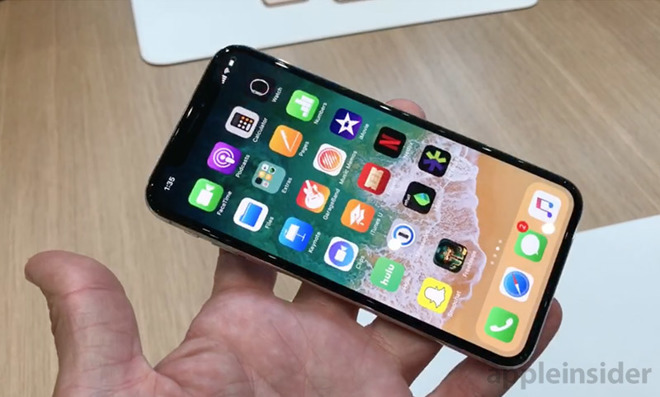 Notably, the idea that last year's iPhone X wasn't selling as well as expected was also recited by Consumer Intelligence Research Partners, which also claimed in January that iPhone 8 was outselling iPhone X, based on survey data. This year, an analyst from the same group was cited here by the Journal as contradicting Apple in outlining the idea that iPhone XS and XR were a "Dutch Auction," and being sold like airplane seats to extract the most money from buyers.